In a congress dominated by smartphones and tablets, Sony brought to MWC a curious little device that can turn any surface into a tablet: the Xperia Touch. 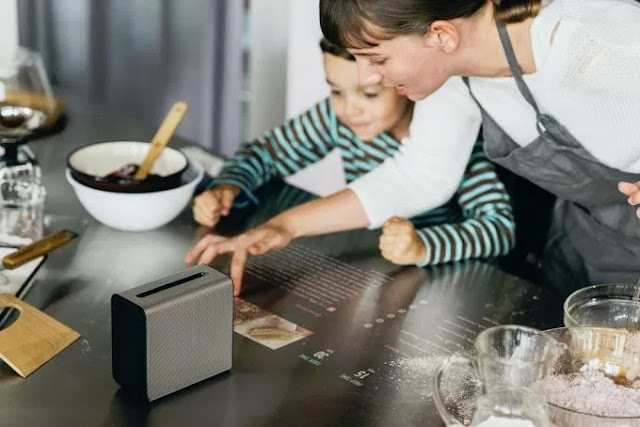 The Xperia Touch is a compact laser projector, capable of projecting a work environment on almost any surface, and with which we can interact with the usual range of touch and gestures, just as if it were a regular tablet. This micro-projector runs Android Nougat and comes with 3GB of RAM, 32GB of eMMC, WiFi 802.11ac, BT 4.2, NFC, HDMI, USB-C. The laser projector has a resolution of only 1366x768, but it has autofocus and can project images from 23" up to 80 ". However, it has a brightness of only 100lm and 4000: 1 contrast, so do not expect much of it in well-lit places. The Xperia Touch is very interesting, but unfortunately has a great "snag": will cost 1499 euros! If it had a friendlier price (much friendlier), I wouldn't hesitate to consider it might become a huge success, but at this price point, I really don't think so.